Go here for more about Mikhail Gorbachev. 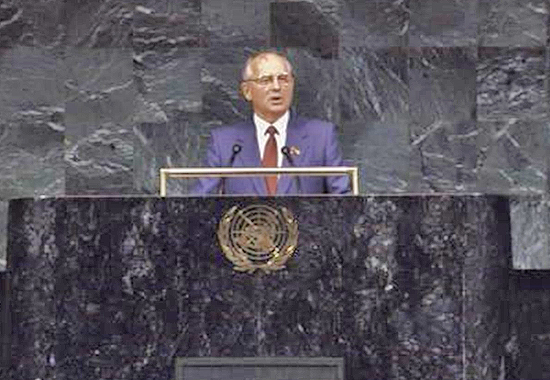 Go here for more about Gorbachev's Freedom of Choice speech. It follows the English translation of an excerpt text transcript of Mikhail Gorbachev's Freedom of Choice speech, delivered at the 43rd U.N. General Assembly Session in New York, N.Y. - December 7, 1988. Two great revolutions, the French revolution of 1789 and the Russian revolution of 1917, have exerted a powerful influence on the actual nature of the historical process and radically changed the course of world events. Both of them, each in its own way, have given a gigantic impetus to man's progress. They are also the ones that have formed in many respects the way of thinking which is still prevailing in the public consciousness. That is a very great spiritual wealth, but there emerges before us today a different world, for which it is necessary to seek different roads toward the future, to seek -- relying, of course, on accumulated experience -- but also seeing the radical differences between that which was yesterday and that which is taking place today. The history of the past centuries and millennia has been a history of almost ubiquitous wars, and sometimes desperate battles, leading to mutual destruction. They occurred in the clash of social and political interests and national hostility, be it from ideological or religious incompatibility. All that was the case, and even now many still claim that this past -- which has not been overcome -- is an immutable pattern. However, parallel with the process of wars, hostility, and alienation of peoples and countries, another process, just as objectively conditioned, was in motion and gaining force: The process of the emergence of a mutually connected and integral world. Further world progress is now possible only through the search for a consensus of all mankind, in movement toward a new world order. We have arrived at a frontier at which controlled spontaneity leads to a dead end. The world community must learn to shape and direct the process in such a way as to preserve civilization, to make it safe for all and more pleasant for normal life. It is a question of cooperation that could be more accurately called cocreation and codevelopment. The formula of development "at another's expense" is becoming outdated. In light of present realities, genuine progress by infringing upon the rights and liberties of man and peoples, or at the expense of nature, is impossible. The very tackling of global problems requires a new "volume" and "quality" of cooperation by states and sociopolitical currents regardless of ideological and other differences. The compelling necessity of the principle of freedom of choice is also clear to us. The failure to recognize this, to recognize it, is fraught with very dire consequences, consequences for world peace. Denying that right to the peoples, no matter what the pretext, no matter what the words are used to conceal it, means infringing upon even the unstable balance that is, has been possible to achieve. Freedom of choice is a universal principle to which there should be no exceptions. We have not come to the conclusion of the immutability of this principle simply through good motives. We have been led to it through impartial analysis of the objective processes of our time. The increasing varieties of social development in different countries are becoming in ever more perceptible feature of these processes. This relates to both the capitalist and socialist systems. The variety of sociopolitical structures which has grown over the last decades from national liberation movements also demonstrates this. This objective fact presupposes respect for other people's vies and stands, tolerance, a preparedness to see phenomena that are different as not necessarily bad or hostile, and an ability to learn to live side by side while remaining different and not agreeing with one another on every issue. The draft amendments to the criminal code are ready and waiting their turn. In particular, those articles relating to the use of the supreme measure of punishment are being reviewed. The problem of exit and entry is also being resolved in a humane spirit, including the case of leaving the country in order to be reunited with relatives. As you know, one of the reasons for refusal of visas is citizens' possession of secrets. Strictly substantiated terms for the length of time for possessing secrets are being introduced in advance. On starting work at a relevant institution or enterprise, everyone will be made aware of this regulation. Disputes that arise can be appealed under the law. Thus the problem of the so-called refuseniks is being removed. We intend to expand the Soviet Union's participation in the monitoring mechanism on human rights in the United Nations and within the framework of the pan-European process. We consider that the jurisdiction of the International Court in The Hague with respect to interpreting and applying agreements in the field of human rights should be obligatory for all states. Finally, being on U.S. soil, but also for other, understandable reasons, I cannot but turn to the subject of our relations with this great country. ... Relations between the Soviet Union and the United States of America span 5 1/2 decades. The world has changed, and so have the nature, role, and place of these relations in world politics. For too long they were built under the banner of confrontation, and sometimes of hostility, either open or concealed. But in the last few years, throughout the world people were able to heave a sigh of relief, thanks to the changes for the better in the substance and atmosphere of the relations between Moscow and Washington. We acknowledge and value the contribution of President Ronald Reagan and the members of his administration, above all Mr. George Shultz. All this is capital that has been invested in a joint undertaking of historic importance. It must not be wasted or left out of circulation. The future U.S. administration headed by newly elected President George Bush will find in us a partner, ready -- without long pauses and backward movements -- to continue the dialogue in a spirit of realism, openness, and goodwill, and with a striving for concrete results, over an agenda encompassing the key issues of Soviet-U.S. relations and international politics. The inheritance of inertia of the past are continuing to operate. Profound contradictions and the roots of many conflicts have not disappeared. The fundamental fact remains that the formation of the peaceful period will take place in conditions of the existence and rivalry of various socioeconomic and political systems. However, the meaning of our international efforts, and one of the key tenets of the new thinking, is precisely to impart to this rivalry the quality of sensible competition in conditions of respect for freedom of choice and a balance of interests. In this case it will even become useful and productive from the viewpoint of general world development; otherwise; if the main component remains the arms race, as it has been till now, rivalry will be fatal. Indeed, an ever greater number of people throughout the world, from the man in the street to leaders, are beginning to understand this. Esteemed Mr. Chairman, esteemed delegates: I finish my first speech at the United Nations with the same feeling with which I began it: a feeling of responsibility to my own people and to the world community. We have met at the end of a year that has been so significant for the United Nations, and on the threshold of a year from which all of us expect so much. One would like to believe that our joint efforts to put an end to the era of wars, confrontation and regional conflicts, aggression against nature, the terror of hunger and poverty, as well as political terrorism, will be comparable with our hopes. This is our common goal, and it is only by acting together that we may attain it.